Disney’s highly-entertaining dip into the world of video-game culture was heralded by portents of dense intertextual crossovers and winking references to highlights of the faded arcade realm. 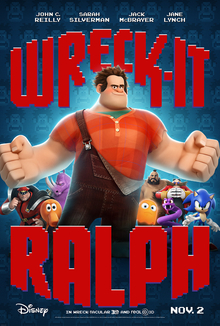 But what emerged instead under the title of Wreck-It Ralph was something more conventional narratively and thematically which creates its own core of characters and sociopolitical implications, using licensed characters and visual trademarks from iconic video games as cameo-based, referential background colour, rather like Who Framed Roger Rabbit? once did. Like Roger Rabbit, however, the resulting product is not only an excellent technical achievement, but a strong and spirited entertainment of its own, and not merely a post-modern sprinkling of hat-tips to gamers of many ages. The titular wrecker (voiced by John C. Reilly) is self-introduced as the villain of a 30-year-old stand-up arcade buttons-and-stick game called Fix-It Felix, Jr. Ralph is a red-haired, big-handed behemoth in overalls who climbs and smashes up an apartment building while the game’s earnest, magic-hammer-wielding contractor protagonist (Jack MacBrayer of 30 Rock) chases behind furiously fixing his damage. Owing something to the 1980s arcade and Sega Master System classic Rampage, the game has retained its spot in the arcade even as the gaming landscape around it has changed. But its rigid pixelated reality has begun to wear on Ralph, who, like all other game characters in the arcade, is a sentient being with a consciousness inside the game machine and in the inter-game exchange system. This world is centered around the powerbar hub of Game Central Station, where characters from all of the arcade’s consoles mingle in the off-hours after closing time, chatting, having drinks at the bar from Tapper, and even pouring out their frustrations in support groups. The Bad-Anon group hosted by Clyde from Pac-Man is where Ralph tells his story (other attendees include Super Mario Bros. antagonist Bowser, Zangief from Street Fighter, and a thoughtful zombie wielding a pair of hatchets). It’s not so much the monoto ny that bothers Ralph as it is the social exclusion he feels in his game home. Fix-It Felix (who was merely given the magic hammer from his father, a reference to the inherited privilege of the upper classes) is feted in the penthouse of the apartment building he fixes each day by its rotund bourgeois residents (who move in the digital-jerk progressions of 8-bit graphical interfaces that prove to be even more hilarious in the rounded hyper-reality of feature computer animation). Ralph, meanwhile, is thrown from the roof at the end of every game by these same residents to land in a mud puddle. If that isn’t humiliation enough, at night he dwells in the adjacent mountainous rubbish dump like a common homeless ogre, snuggling down for the night beneath a makeshift quilt of the bricks shaken loose by his daily in-game smashing. Ralph’s literal pariah state is constructed as part of the natural game-order, but there’s a razor-sharp suggestion of real-world socioeconomic disparities lying just beneath and strongly underlining it. Ralph is a sensitive soul behind all of his tempermental destruction, though, and is stung by his rejection by his fellow game-citizens. But this is the code of the game: Felix is the good guy, Ralph is the bad guy, and Bad-Anon’s mantra emphasizes that this cannot change and must be accepted to ensure the mental and emotional health of the game-world’s villains as well as the gaming-world order. Ralph tries to penetrate the invisible curtain of social regard sundering heroes and villains, showing up uninvited to a celebration of the game’s three-decades’ anniversary, but the divisions (always-already coded not only technologically but also socioeconomically) prove too resilient. This latest public rebuff is one too many for the tender-hearted giant, and Ralph departs Fix-It Felix, Jr. on a quest for a hero’s medal of his own, which he conceives of as his golden ticket to the appreciation of his peers. Stumbling onto a shell-shocked mecha-marine by the men’s room in Tapper, Ralph learns that just such a medal is the ultimate reward of the Halo-esque first-person-shooter Hero’s Duty. Ralph steals into the stark sci-fi military environment of this game, but finds its high-definition action to be overwhelming. Still, he survives the assault of hordes of malevolent Cy-Bugs (game characters who die in their own game can regenerate, but stay dead if killed in other games, a rule of the universe that the film does not explore enough) and snatches the medal, only to be hurled (along with a newly-hatched Cy-Bug) out of the game and into a saccharine candy-themed racing game called Sugar Rush. There he meets a cute but snarky black-haired girl named Vanellope von Schweetz (Sarah Silverman), who steals his medal to employ as an entry fee to the nightly candy-car race to determine the selectable player avatars in Sugar Rush for the next day in the arcade. Vanellope’s entrance and potential avatar-hood is staunchly opposed by the game’s autocrat King Candy (Alan Tudyk, all spittle and nebbishness), but she’s plucky, engaging and has something he wants, after all. Ralph decides to help her in her quest to win the race, at first to get his medal back but thereafter because he recognizes a kindred outcast spirit as well as a rewarding opportunity to create rather than to destroy. She’s a regular Maria Cand-retti! Get it? A bit too sophisticated, I know. Wreck-It Ralph is expertly helmed by veteran animator Rich Moore, who directed many Classic Period episodes of The Simpsons including the legendary Michael Jackson guest-spot of “Stark Raving Dad”, the Top-5-Episodes-Ever “Marge vs. the Monorail”, and “Cape Feare”, with its famous extended rake gag. With that sort of resume, you know that he’s kind of good. Director’s pedigree aside, Wreck-It Ralph is highly inventive but not often really funny; it entertains with confidence, but doesn’t become a great animated comedy like Cloudy with a Chance of Meatballs. It’s worth bringing up that film, because the richly-imagined sweets kingdom of Sugar Rush owes far more to Cloudy‘s oversized-food structural design than to any established video-game-verse. With more than half of the film set there, the candy-world needs to be clever and richly-drawn and certainly is: King Candy’s security forces include two cops in the shape of anthropomorphic donuts (hardy-har) and Oreo palace guards who chant their brand name in a homage to The Wizard of Oz (genuine hars for that), the racers have twee saccharine monikers similar to Vanellope’s and resemble various desserts, and a Mentos-and-diet-cola volcano figures prominently in the climax. Wreck-It Ralph is also notable for the gender of its best-written characters: they’re both women. Vanellope could have been a highly irritating creation, but instead is a hugely likable impertinent oddball. The writing is quite good, but it’s Silverman, finally granted an apt playground for her slightly-askew, whip-tongued coquettish comic style, who truly shines. And if that isn’t enough, another female comic heavyweight shows up, too: noted verbal flamethrower Jane Lynch voices Sergeant Calhoun of Hero’s Duty, a comely but no-nonsense warrior who chases Ralph and the Cy-Bug he unwittingly unleashed in Sugar Rush with an assist from the hopelessly square Fix-It Felix. Aside from her woman-of-action act, she also lets loose with a PG-rated litany of colourful R. Lee Ermey drill-sergeant-isms (“The selfish man is like a mangy dog chasing a cautionary tail”). In addition to its considerable entertainment content, Wreck-It Ralph further contextualizes the continuing dialogue on the ostracized hero figure provided in recent animated features, as discussed in my ParaNorman review. While Ralph’s exclusion in his game is quite obviously grounded in assumptions of socioeconomic disparity and class difference, Vanellope’s pariah situation is based more so in political philosophy and the ruthless self-preservational calculations of the powerful. 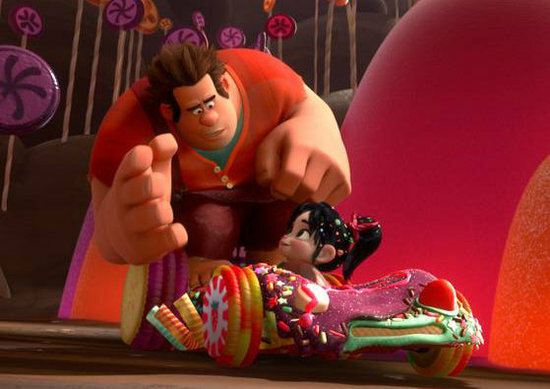 At the predictable point of conflict in the plot, King Candy attempts to dissuade Ralph from helping Vanellope to enter the race because, at least according to him (and King Candy never seems like anything other than an unreliable source), she’s the product of a system glitch and could threaten the entire existence of Sugar Rush if her technical faults lead to a dreaded out-of-order sign and removal from the arcade entirely. Additionally, as a glitch, she would not be able to leave the game as the other characters would when it is shut down, and she would be deleted along with the rest of the remaining game elements. When did you first feel bad about being… bad? Thus, King Candy argues that allowing the individualist “freak” Vanellope to compete on a level playing field with others would not only threaten the common good but her own safety as well. The monarch laments that with the kingship comes such hard choices (heavy is the head that wears the candy crown). The difficult balance of the desires of the individual with the needs of the collective is straight out of Hobbes’ Leviathan, and is also referenced in the self-examining Rango. King Candy’s perspective is that certain seditious internal elements must remain excluded and discriminated against, not only for the common security of his society but for the personal protection of those elements as well. That King Candy turns out to be a tyrannical manipulator is unsurprising, and locates his emphasis of trading freedom for security in multiple real-world historical examples (not least of all America’s contemporary national security state) as well as in Hobbes’ work (Leviathan was ultimately an argument for the monarchy as the ideal stabilizing force in the social order, after all). Wreck-It Ralph invokes these themes as many recent animated features do, as simultaneous narrative and marketing appeals to its target audiences of smart children and culturally-aware adults, both groups assumed to nurture some grievances when it comes to social exclusion by a conformist mainstream. These themes are also undoubtedly redolent of genuine personal meaning for the creative figures behind the films’ creation, many of whom experienced the ostracizing and even outright bullying for their divergent interests that they empathize with in the lives of their target audiences. It shouldn’t be surprising that the recent wave of outcast narratives in animated film has accompanied both the new commercial ascendancy of geek culture in Hollywood and more widespread anti-bullying initiatives on a social level. As entertaining and thematically rich as Wreck-It Ralph is, however, it mostly joins the middle-ground of the current animated feature discourse on the outcast figure. One can’t help but feel that a fuller engagement with the video-game culture that serves mostly as a backdrop to the narrative might have provided greater access to these ideas. Who in recent pop-culture circles, after all, is more marginalized than the video-game nerd? Wreck-It Ralph‘s pariah discourse might have benefitted from the deeper involvement of gaming, rather than nodding allusively to it before immersing itself in the sugary imaginings of the Commonwealth of Candyland.